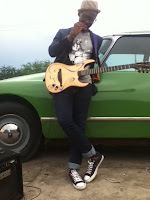 A fresh breeze is blowing through Nigerian soul music on the guitar strings of a young performer called Bez. Bez goes to the Lagos Carnival, meets random people, gets bounced from the VIP and gets his phone jacked. I can't help, but admire the beautiful streets of Lagos. Anyway, click play to see how Bez's phone got jacked. o gosh!!!! lol!!! redirecting and den wat? fone jack?!!! ma man! we go catch the guy! we gat proof yo!